I left my iPad on JAL flight when I travelled to Japan recently. “I left my iPad on JAL flight” I googled the phrase to look for ways to get back my iPad. I didn’t think my situation was radically uncommon. Luckily I found some relevant JAL FAQ page. My friend helped me to phone the JAL Henada Airport hotline the next day morning, they questioned us for details. They did find my iPad and verified I was the owner! We went to the airport in the afternoon and collected my precious iPad! Thank JAL! Regarding iPad, one common complaint from the Apple community is the lack of software advancement. iOS cannot empower iPad more useful that iPhone! User cannot make the best use of the bigger screen! For example, one cannot use Flipboard (to find stuff) and Amazon (to shop) at the same time in landscape mode. Many popular apps do not support Split View on iPad. As Android matures and hardware improves, Android devices can do somethings better than iPad and iPhone! 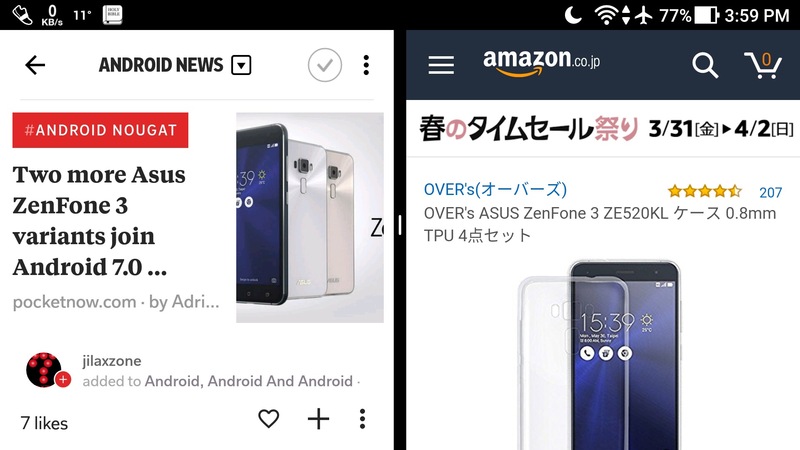 Below is a multi-window session on ASUS Zenfone 3 5.2″. This smartphone is smaller and less powerful when compare to recent iPads but it does a better multi-window job! By the way, I find Flipboard works better on Android. The Android version will usually return to the last article I was reading when I resume using Flipboard, while the iOS version will almost restart every time. In order to completely read an article if you switch between Flipboard and other apps frequently, you’re better using the Flipboard Read Later feature or Liking the article to remark it. Both requires additional steps. Google Translate in any app is another useful and convenient feature. 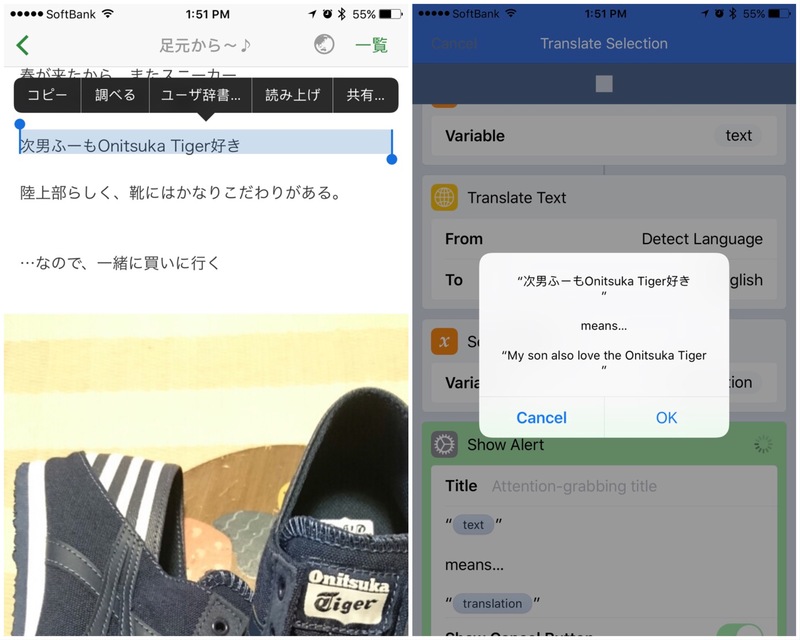 Use the Amazon app again example, as shown in the left-hand-side of the picture below, select the text and then tap the Translate option. 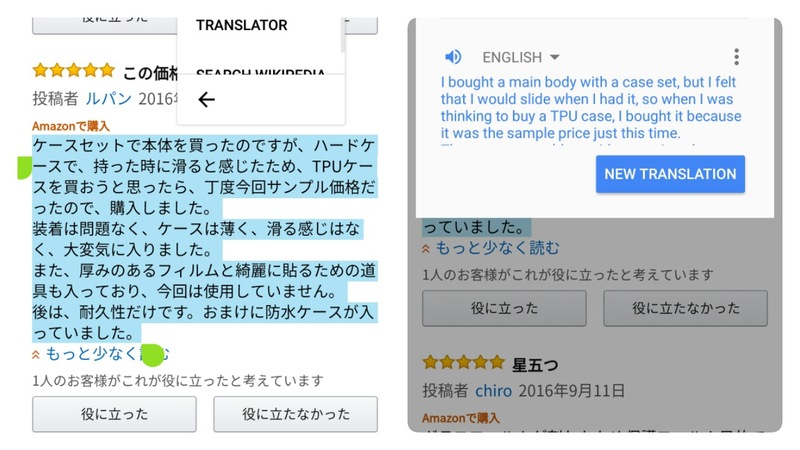 Right-hand-side shows the translation inside the Amazon app. iOS does not provide similar feature. However, the powerful Workflow does! Translate Selection in Conrad’s collection can do translation in any app supporting App Extension. Hope Apple’s acquisition of Workflow will make iOS more powerful soon! Android: What time is London when Hong Kong is 5pm? iPhone X review. It is Freedom.